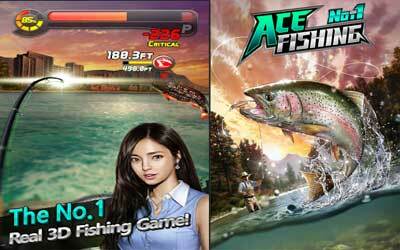 Ace Fishing: Wild Catch APK has been released in new version 2.4.2. This is a 3D adventure fishing game. This game can be downloaded and played for free. In this game, you can be fished easily with just one touch button. You can catch a variety of fish and taste a variety of fishing techniques that fun. You can also follow the competition play 1 against 1 with other players from around the world. When first playing, you will be given some instructions and tutorials as a way of fishing. Whenever fishing, this will reduce the energy and it takes approximately 10 minutes to recover the energy. The game comes with captivating 3D graphics. You can feel the direct interaction with the catch and enjoy the real effect in this game such as splashing water, auto focus, vibration, and others. You will have the excitement of fishing that makes you addicted and not feel bored. In addition, the location offered was not only being in one location. You will be taken around the world and meet a wide variety of different types of fish in each area. Make sure you unlock the entire map to catch all the fish were there. The game is equipped with Global Ranking. To get a place in the Global Ranking, you have to compete in a fishing tournament together with all the players from around the world. Ace Fishing: Wild Catch for Android has the same appearance as the Fishing Superstar because it was issued by the same developer. Although the concepts, formulas, and social features are the same, but the difference lies in better 3D graphics used on this app. To unlock some of the facilities, it takes in-app purchase. Some users may be bothered with such features. However, with patience you can progress to the top levels with fair play. This could be one of the lessons to be patient as the actual anglers. Get hooked with simple, one-touch controls! Who says fishing is boring? Just 3 seconds is all it takes before heart-pounding action! Interact with catches so life-like they could fly off your screen! Perfectly recreated physics of fishing means you’ll be able to feel the excitement at your fingertips! Fishing rods customizable with lines of varying length and tension strength! Hang in there tire out the fish through epic struggles! Fish movements and characteristics captured with stunning realism! Complicated mechanisms made easy to bring the most realistic fishing experience to mobile gaming! I’m pretty addicted to this game right now. Very fun. And great graphics. There are tons of goodies to be won and freebies to be given.